The field of Computational Neuropsychiatry has been exploding with applications of large deformation brain mapping technology providing mechanisms for discovering neuropsychiatric disorders of many types. The hippocampus is a region in the brain that has been implicated in schizophrenia and other neurodegenerative diseases such as Alzheimer’s. Using large deformation brain mapping tools, researchers can define, visualize, and measure the volume and shape of the hippocampus which is important in memory and emotion. These methods allow for the precise assessment of changes in the hippocampal formation. Likewise we have shown that ADHD, Autism, Tourette's syndrome and aphasia affect different areas of thalamus, putamen and caudate. 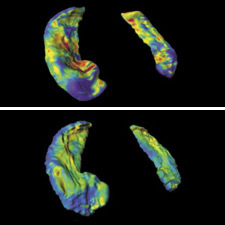 We are looking at how thickness, surface area and volume of cingulate, superior temporal gyrus and prefrontal cortical strcures are affected by Alzheimer's, schizophrenia, deafness, autism, aphasia and normal aging. Featured Research: Predicting CT dosimetry in children via whole body mappings, Large Deformation Diffeomorphic Co-Registration of reconstructed histological and MR volumes. Diffusion Magnetic Resonance Imaging (DMRI) is a technique that produces in vivo images of biological tissues by exploiting the constrained diffusion properties of water molecules. DMRI can potentially be used to infer the organization of several structures in biological tissues. For instance, the extraction of neuronal fibers from brain DMRI can help understand brain connectivity in the corpus callosum, cingulum, thalamic radiations, optical nerves, etc. This has lead to numerous clinical studies showing how DMRI can be used to study brain development, multiple sclerosis, amyotrophic lateral sclerosis, stroke, Alzheimer’s disease, schizophrenia, autism, and reading disability. In order to make DMRI beneficial in both diagnosis and clinical applications, it is of fundamental importance to develop algorithms for analyzing DMRI data. 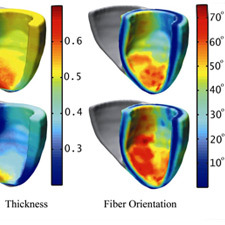 Researchers at CIS are developing methods for estimation, processing, segmentation and registration of diffusion tensor imaging (DTI) and high angular resolution imaging (HARDI). Shapes are prevalent in the outside world and in science. They manifest themselves in live animals, plants, landscapes, or in man-made materials, like cars, planes, building, bridges, and they are designed from aesthetic as well as efficacy considerations. Internal organs of humans or other animals also have a commonly accepted, well-defined shape, and their study is an old science called anatomy. For the human mind, there is an intuitive notion of what shapes are, whether they differ or look alike, or whether they present abnormalities with respect to ordinary observations. However, an analytical description of a shape is much less obvious, and humans are much less efficient at this task: in other terms, we are perfectly able to recognize, say, a brain, but describing it so that someone else can reproduce it is much harder. Researchers at CIS are developing are developing a mathematical framework for describing 2D and 3D shapes, resulting in well-posed mathematical definitions of shape spaces, which form infinite dimensional Riemannian manifolds. This approach provides rigorous tools and algorithms that can be used to segment, compare and analyze shapes in natural and medical images. Featured Research: High Throughput Neuroinformatics, Shape Analysis of Subcortical Structures in Autism and ADHD. 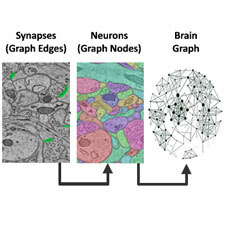 The field of Connectomics has been exploding across spatiotemporal domains, ranging from statis nanoscale imaging (via serial electron microscopy) to dynamic milliscale imaging (via functional magnetic resonance imaging). In addition to the massive computer vision problems (eg, automatic scene parsing of teravoxel multispectral volumes), there are additional challenges associated with the inference and analysis of the estimated brain-graphs (aka, connectomes). Applications utilizing connectomes range the gamut relating brain-networks to cognitive, behavioral, and psychiatric states or responses. Thus, a complete computational statistical theory for the analysis of these attributed brain-graphs is highly desirable. We are in the process of developing and applying such theory and methods. For example, we can now predict five factor personality from resting state functional magnetic resonance imaging, using a combination of manifold learning and permutation testing.